The question of whether neurons are continuously generated in the brain over the course of adulthood has long been a topic of controversy. Part of the difficulty in elucidating the state of neurogenesis in the adult brain is attributed to the lack of well-preserved brain tissue and consistency in scientific protocols, such as tissue preparation and histological techniques, across different research groups. Nevertheless, determining the state of neurogenesis in the adult hippocampus is a critical endeavor because of the great potential it holds for the study and treatment of pathological neurodegenerative disorders like Alzheimer’s disease (AD). In a recent study, Moreno-Jimenez et al. demonstrate that hippocampal neurogenesis does indeed occur over the course of adult life. By meticulous preparation of harvested brain tissue, as well as rigorous refinement and standardization of tissue processing techniques, the research group developed a robust protocol to visualize hippocampal neurons. Using this method, they identified thousands of neurons expressing doublecortin (DCX), a protein found in immature neurons and neuronal precursor cells, in the dentate gyrus of brains from healthy adults spanning 43 to 87 years of age. Furthermore, the researchers used an array of biomarkers to determine the different maturation stages of neurons. For example, they found that DCX+ cells positive for calretinin (CR+) were more indicative of more immature neurons, while DCX+ cells positive for calbindin (CB+) cells were characteristic of a more mature neuronal phenotype. Importantly, the researchers found that in the brains of AD patients, the number of hippocampal DCX+ cells declined the more advanced the stage of the disease, regardless of age. They also determined that this reduction of neurogenesis in AD patients could be detected in the very early stages of the disease. This research work showcases the enduring dynamism and plasticity of the adult brain well into advanced age, and hints at the novel mechanisms underlying the processes of adult hippocampal neurogenesis. The methods developed in this study will likely equip scientists with techniques that will enable fruitful research into treatments aimed at increasing neurogenesis in AD patients. Moreno-Jiménez, E. P. et al. https://www.nature.com/articles/s41591-019-0375-9.Nat. Med. (2019). 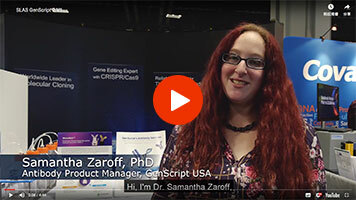 Did you know that GenScript is an award-winning custom reagent antibody supplier? Learn more about us by checking out some of our resources and services below! and why it is GenScript’s top choice for monoclonal antibody generation?